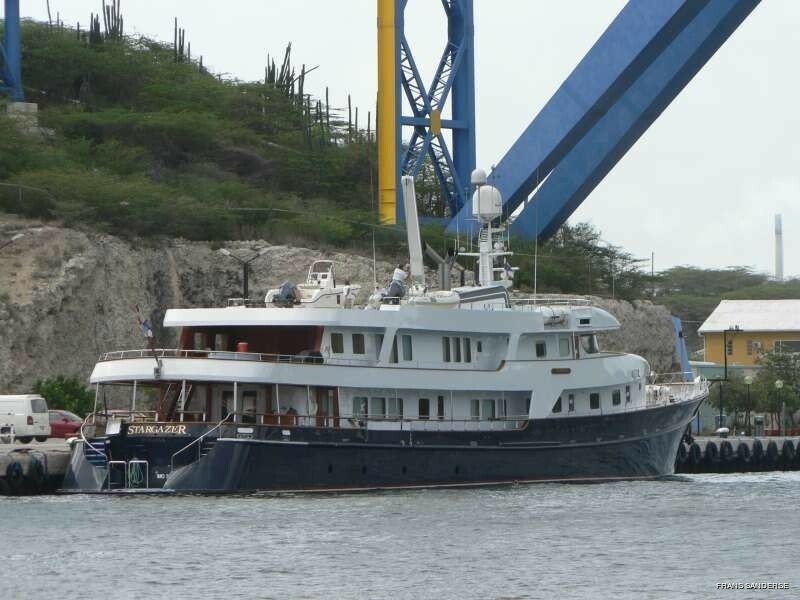 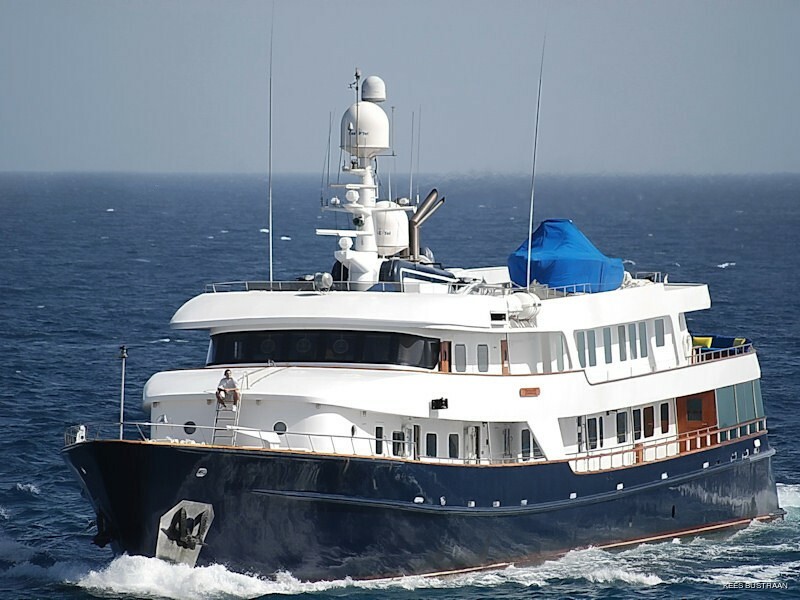 Stargazer is a luxury yacht available for Golf charter vacations in the USA and Caribbean. 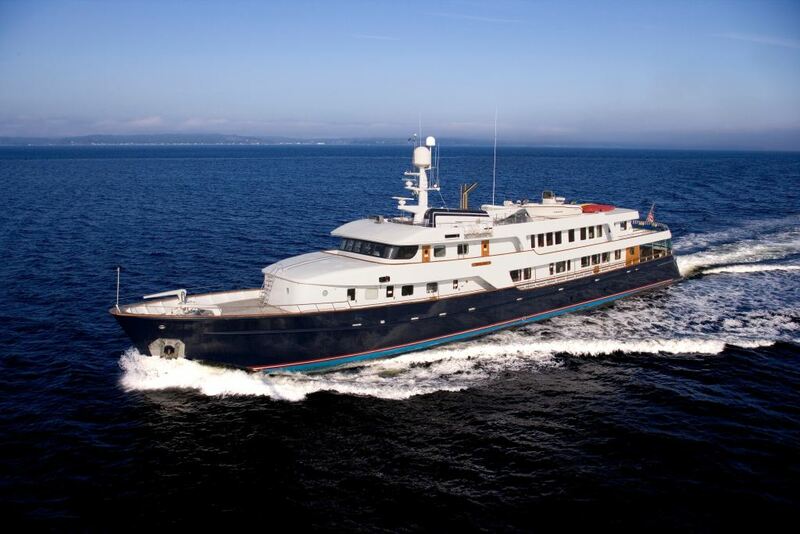 Measuring 180ft (54.9m) in length, M/Y Stargazer otherwise known as the ‘Golf yacht’ is a large expedition yacht with sleek, yet powerful and rugged lines that was built in 1964, refitted in 2010 and accommodates up to 12 guests. 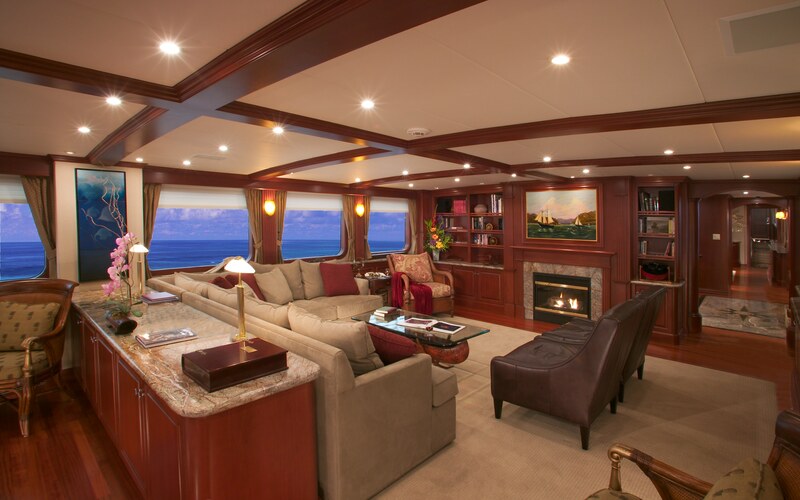 The Golf yacht Stargazer boasts a golf equipment room with sets of demo equipment, a heli-pad that has been set up for coaching and social competitions. 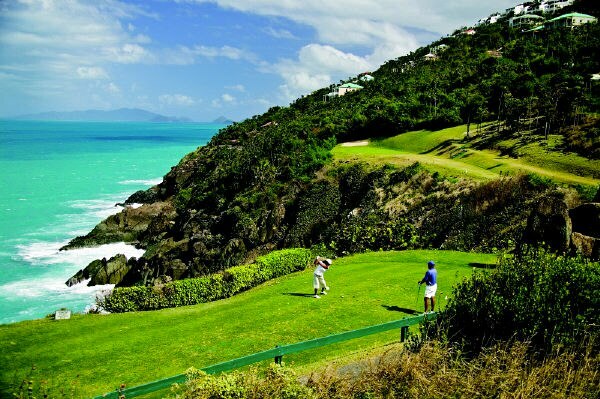 It is also possible to request first class golf coaches onboard who can help to improve your game while cruising throughout the beautiful Caribbean and visiting some of the best golf courses. 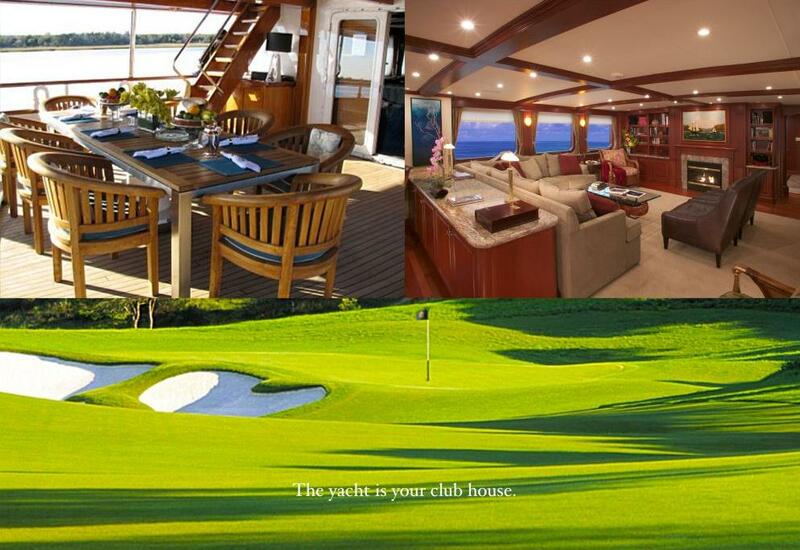 Golf yacht Stargazer is a luxurious yacht offering private, unique golf yacht charter itineraries to discerning guests. 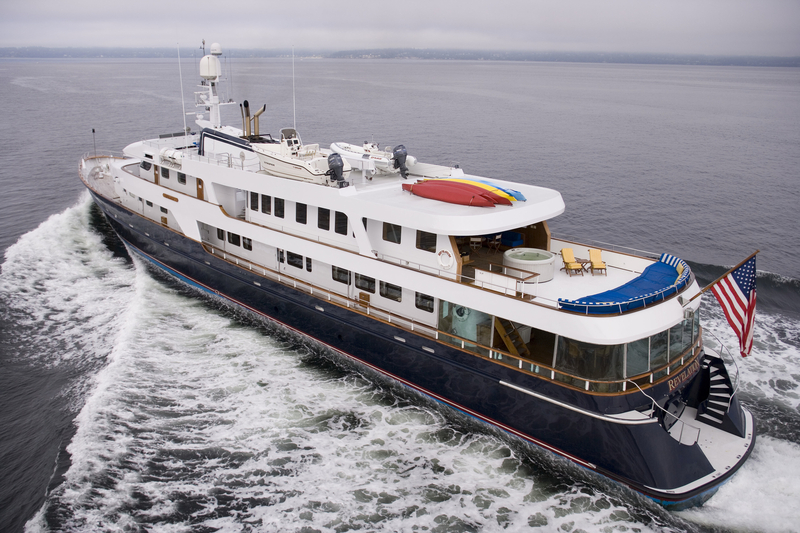 STARGAZER is a legendary mega-yacht with a rich history including hosting celebrity guests and royalty at many major worldwide events such as the Cannes Film Festival, the Monaco Grand Prix. 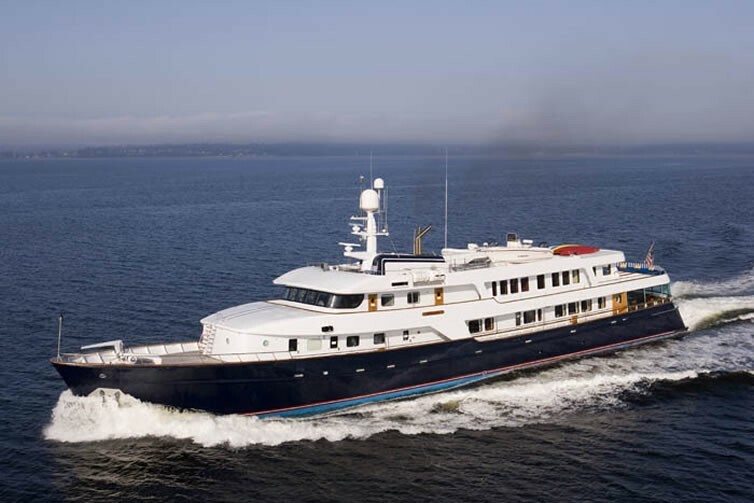 Once owned by Henry Ford II, she has chartered throughout the world and offered safe passage to her guests in ports in the Mediterranean and Caribbean, the islands of the Pacific, Alaska, and both coasts of South America. 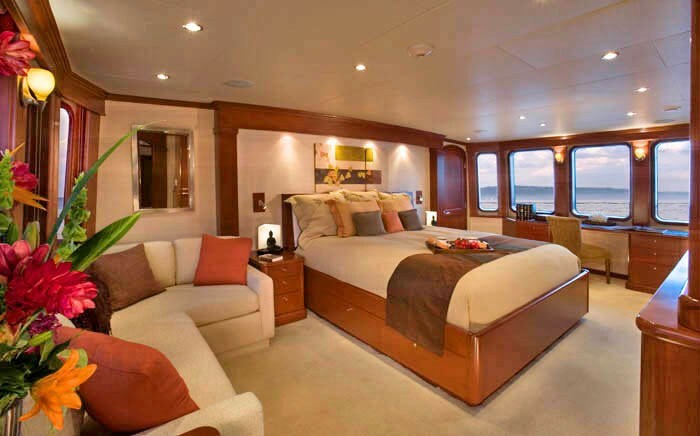 Famous celebrities such as Sean Connery, Frank Sinatra, Hugh Hefner and Kevin Bacon have all had the pleasure of staying on board. 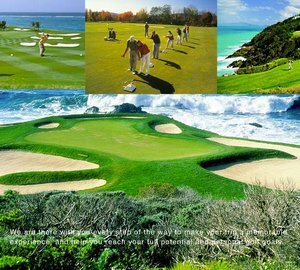 In addition to having golf coaches and a fully equipped golf equipment room with 12 bags of state-of-the-art demo clubs, STARGAZER offers luxurious 5 star accommodation for 12 guests serviced by a crew of 10, including a gourmet chef and serving staff. 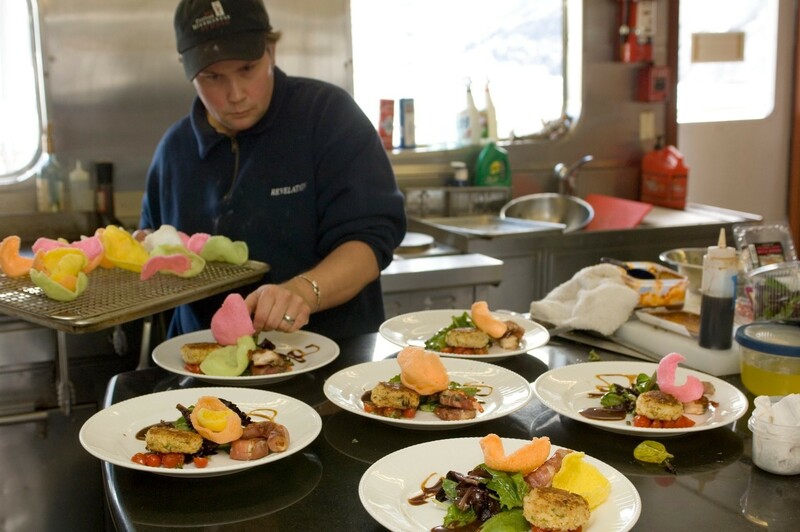 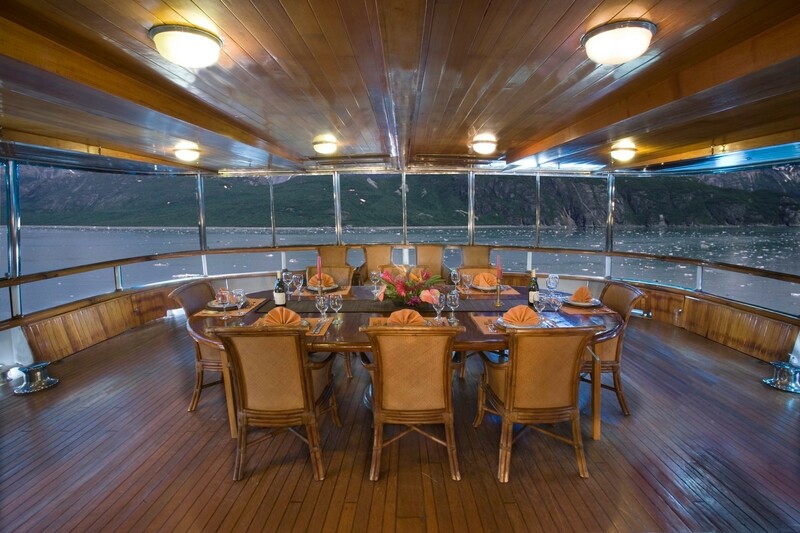 The vessel will easily accommodate 60 guests for elegant evening entertainment at the dock. 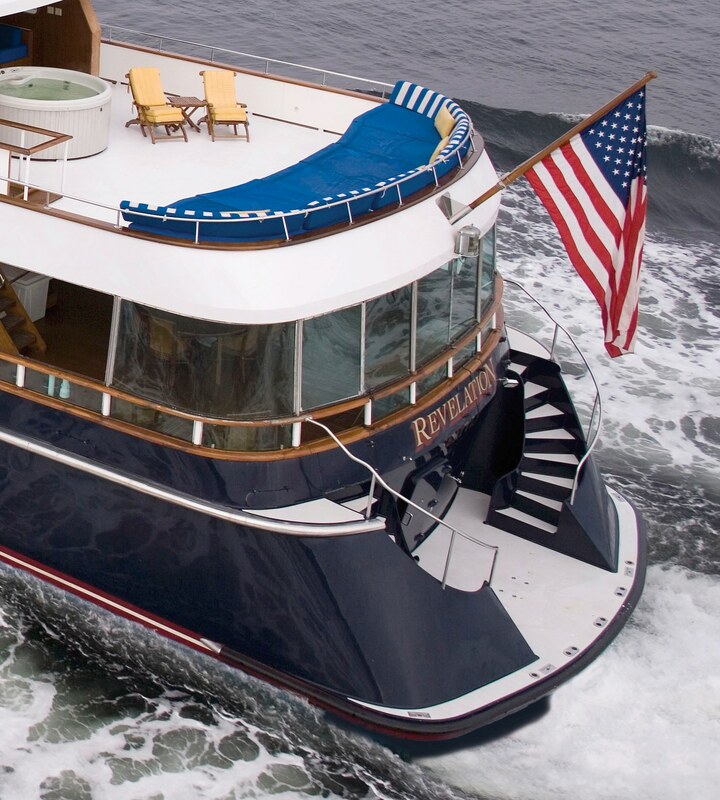 Evening cocktail cruises, luncheons on the skydeck and other unique entertainment opportunities are also possible. 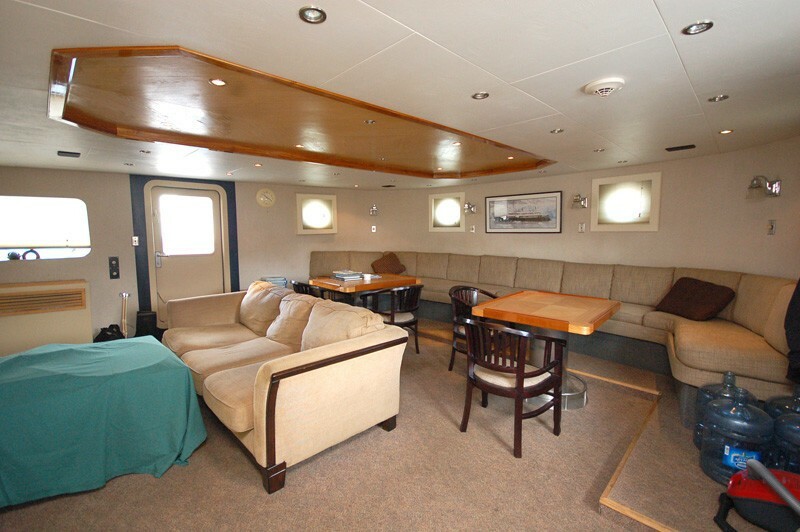 The media room is perfect for high-level presentations; and the aft-deck, skybar and heli-pad driving range present further entertainment options. 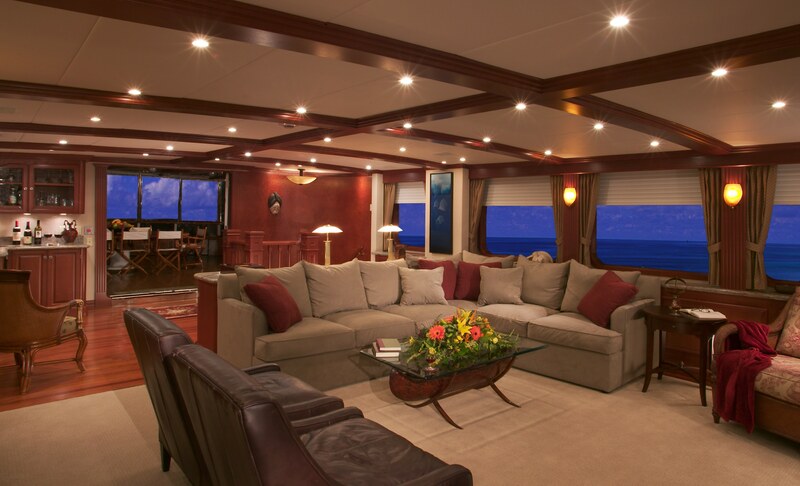 Superyacht Stargazer offers avid golfers a combination of luxury, comfort and adventure travel in exotic, remote locations throughout the Caribbean, United States and further afield, providing a means of luxury transport and entertainment between top quality golf courses while being instructed by professional golf coaches on board. 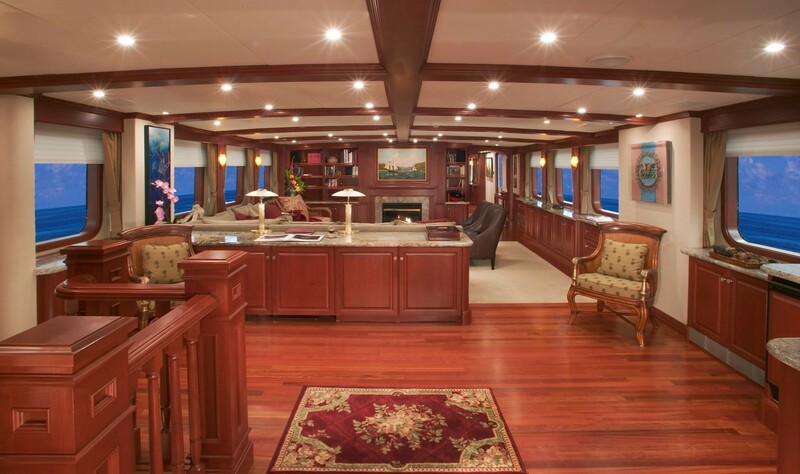 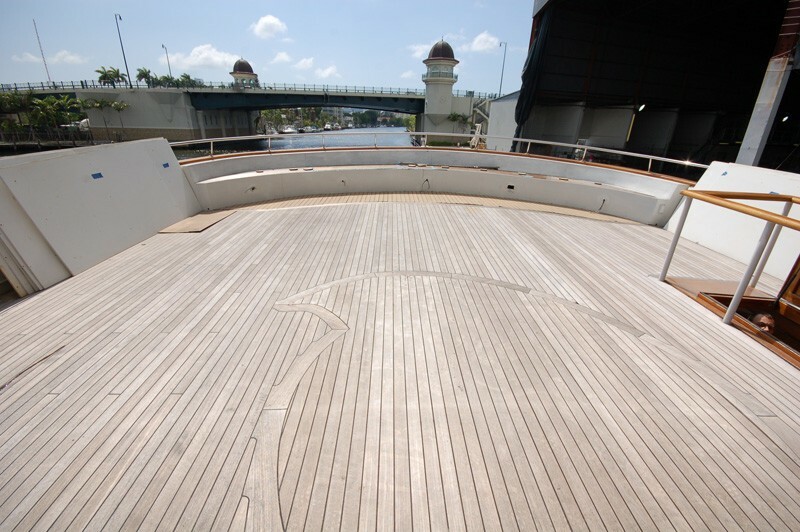 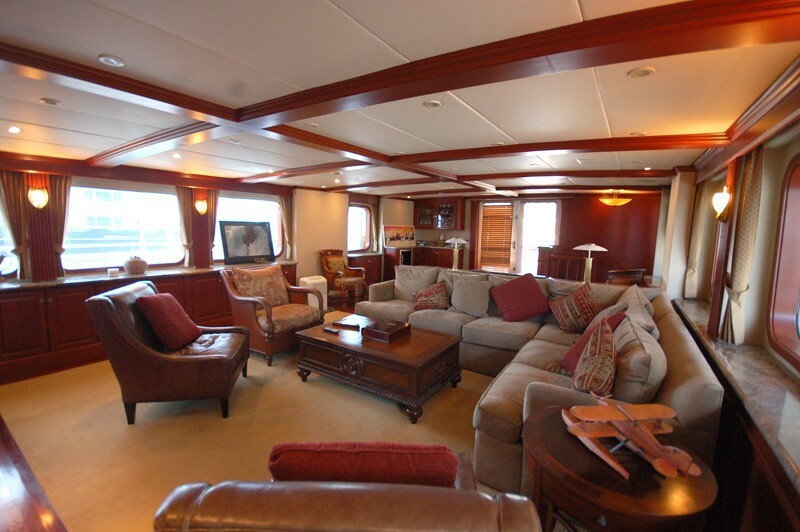 Stargazer’s main salon on the main deck aft is beautifully finished with natural wood floor, and rich furnishings providing a gentlemen’s club atmosphere. 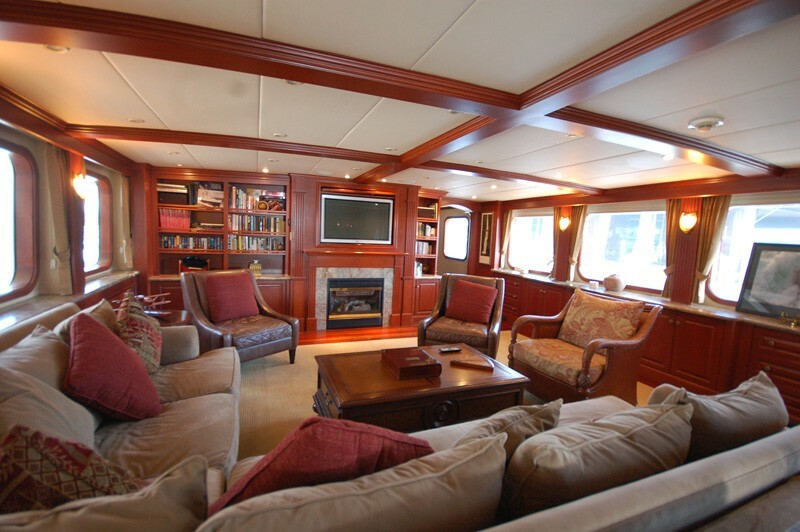 There is a Bar, refrigerator and entertainment center with large plasma SAT TV, DVD, VCR fitted above a gas fireplace, providing a wonderful ambience after a challenging day on the Golf course. 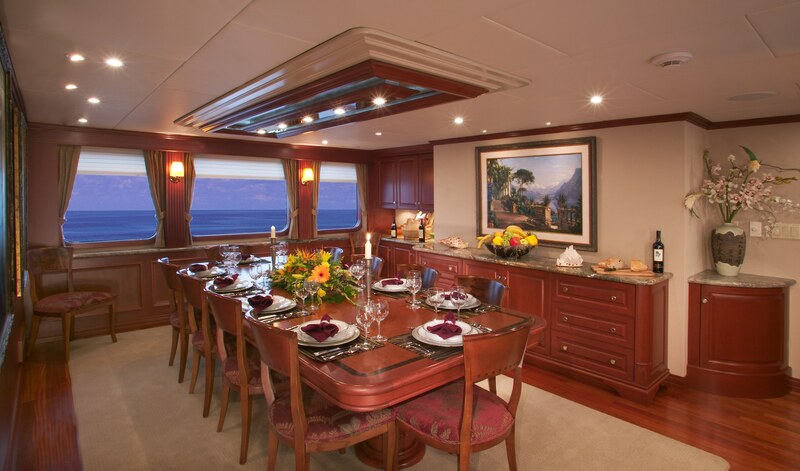 The formal dining salon on the main deck is located amidship port and can seat up to 12 guests, The Sky Bar on the upper level is located to the aft and boasts a bar, CD player, heat and air conditioned with large windows for viewing to wonderful Caribbean seascape. 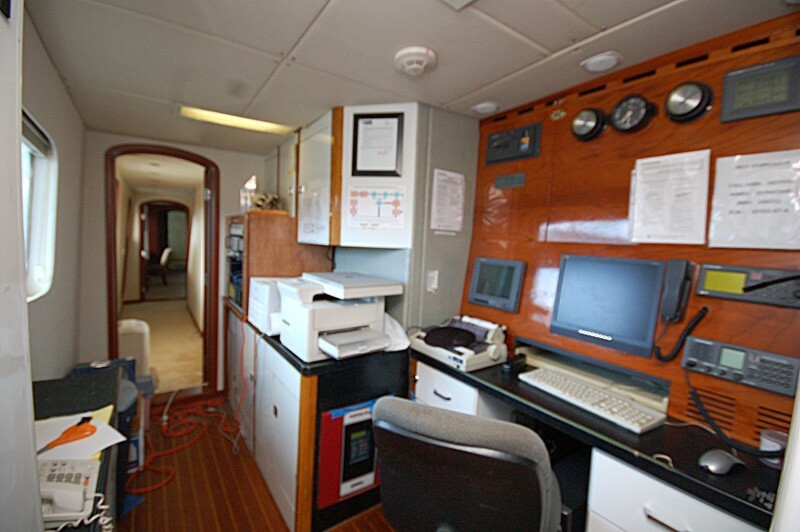 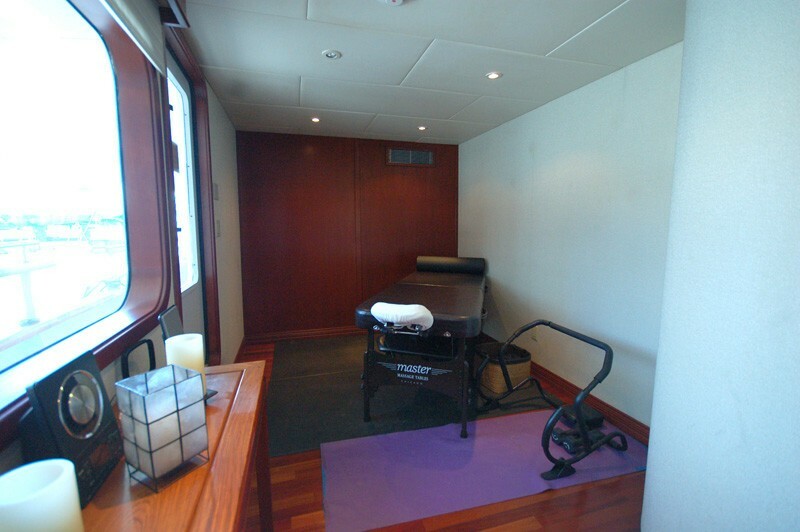 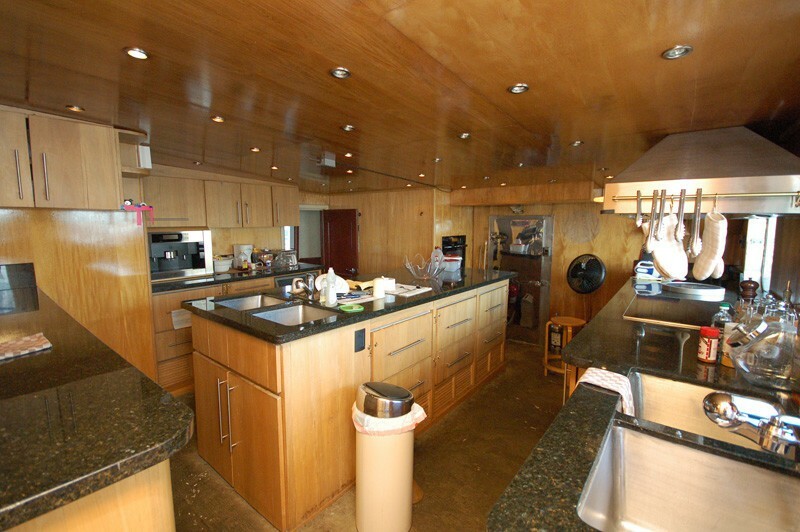 Stargazer also has a Wellness Center/Study on the main deck located amidship port with fridge and sink and a massage table and wide variety of massage and oil products, Stair Master and bike. 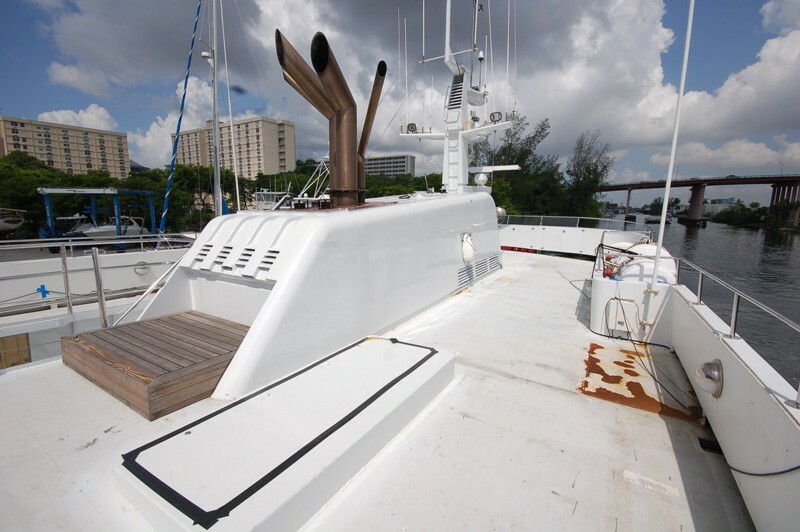 Stargazer also has plenty of water sport toys including 3 Yamaha PWC's, snorkelling gear, and deep sea fishing gear. 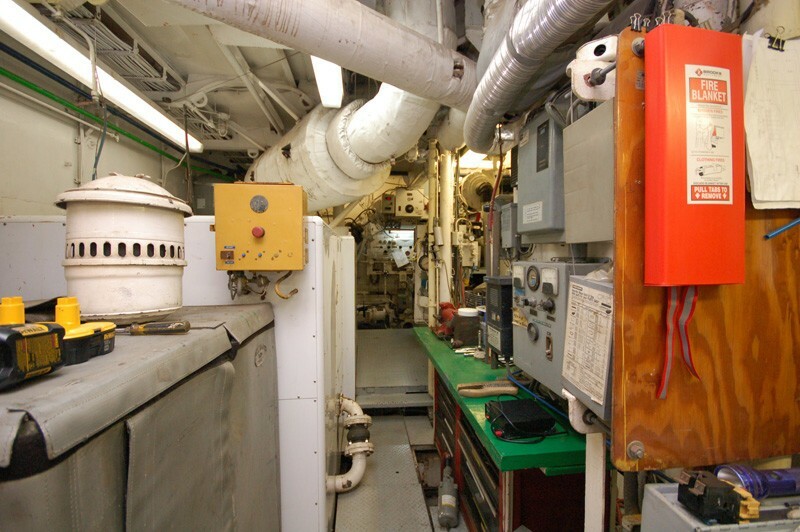 A Dive compressor, 4 sets scuba gear. 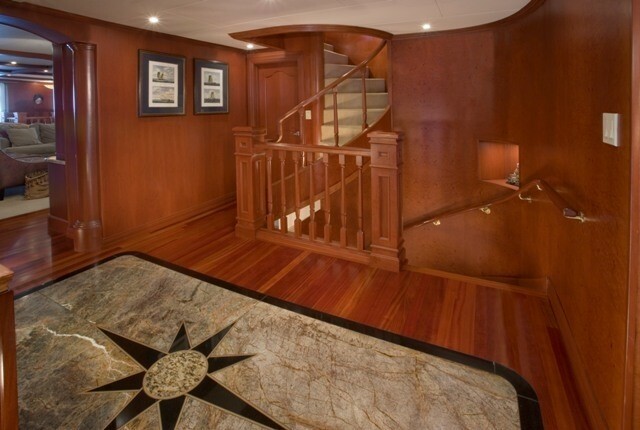 19’ hard bottomed Novurania skiff. 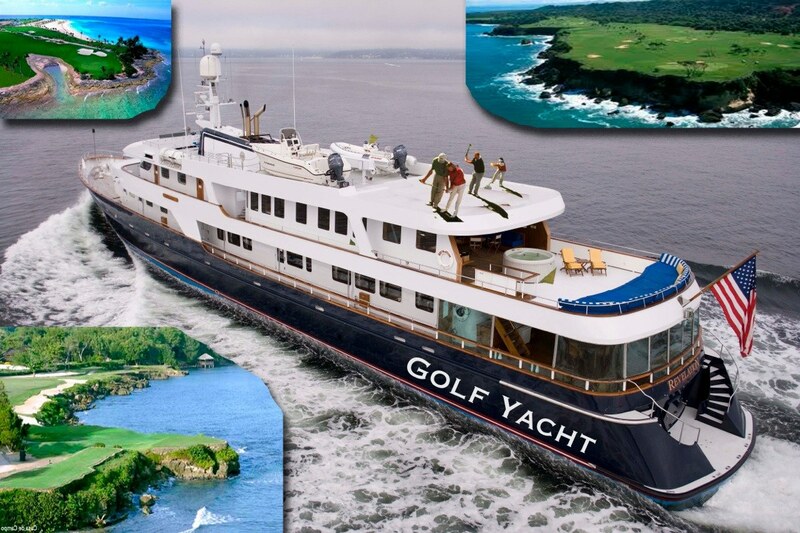 Robert McKnight, together with PGA Champions Tour player Pat Horgan III, and the yacht captain - have been developing a program to take groups (of up to 12 players) along with two coaches on golf yacht itineraries in Florida, The Bahamas, Puerto Rico, Dominican Republic, the mid-Atlantic states, and New England as well as the possibility of Jamaica, Porto Rico and Mexico. 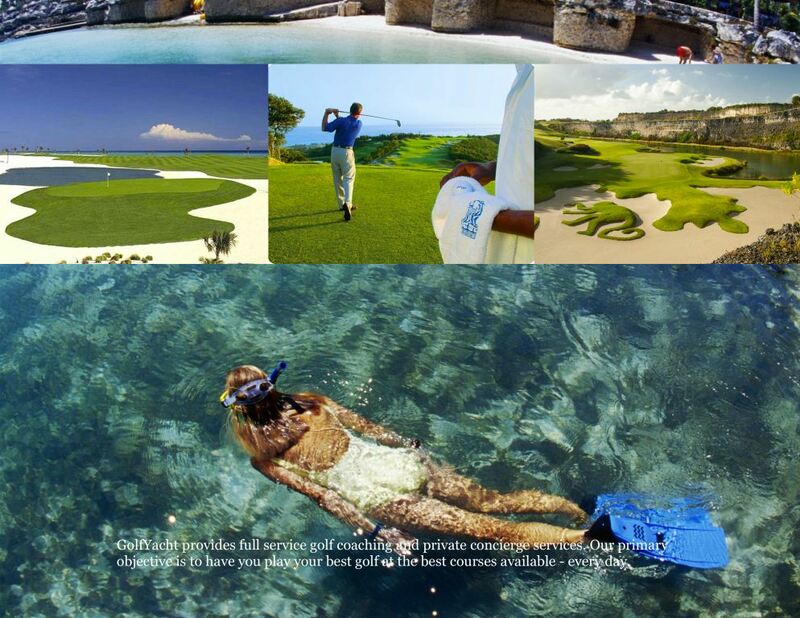 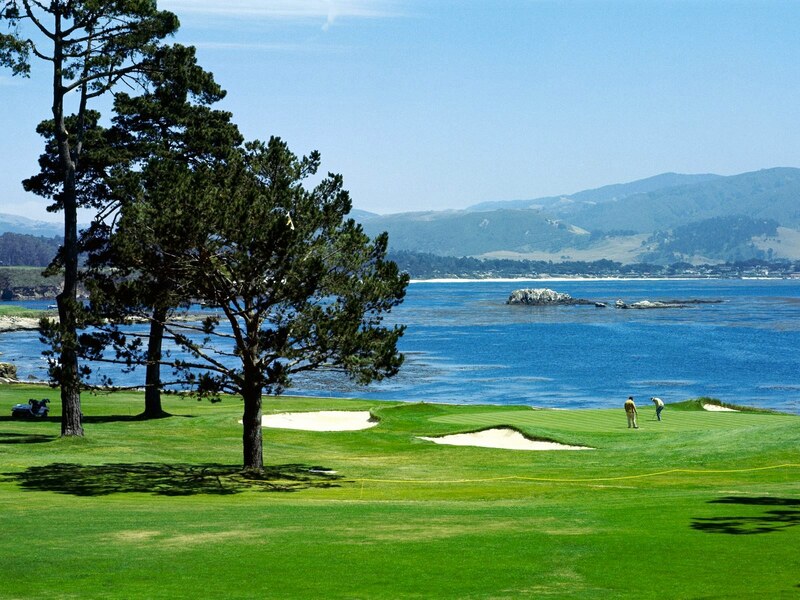 Contact CharterWorld for further details on the golf itineraries. 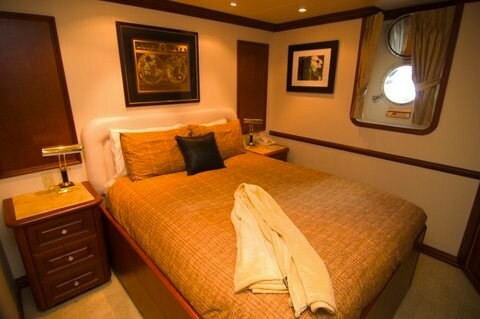 The yacht can be booked for a full week, or a 3-4 day long weekend. 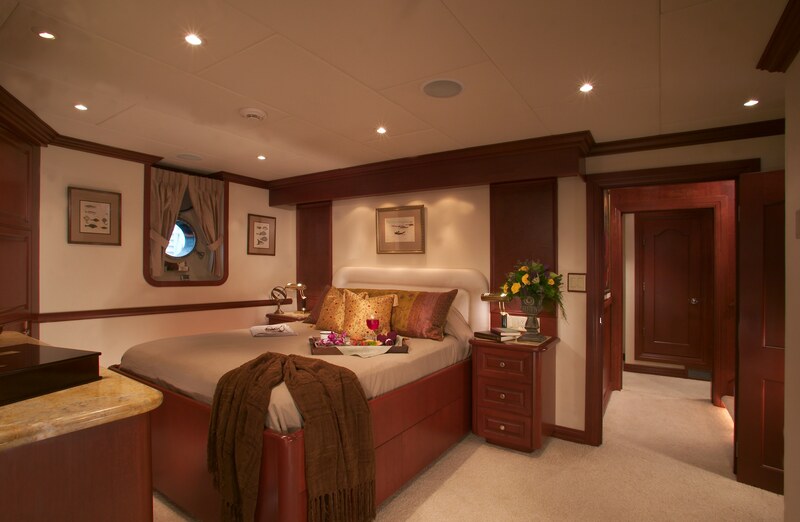 This is a 7-stateroom yacht. 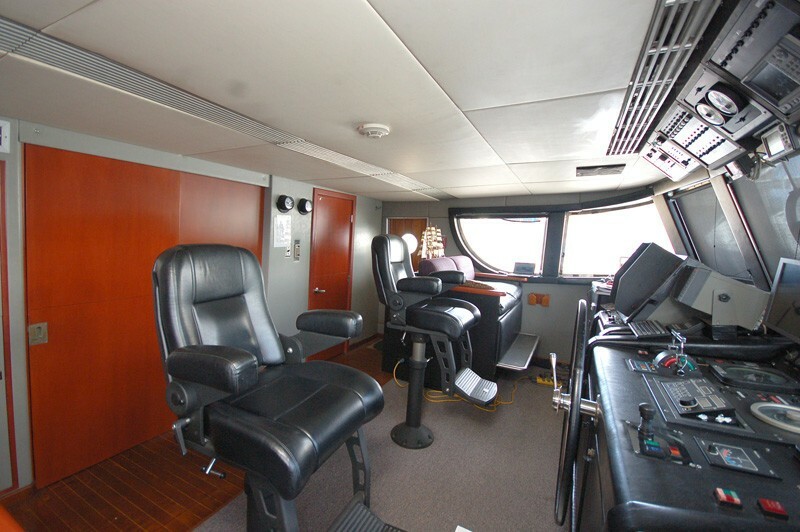 If we have all single players for a long-weekend, we can also use the Captain's cabin on the bridge as a guest cabin. 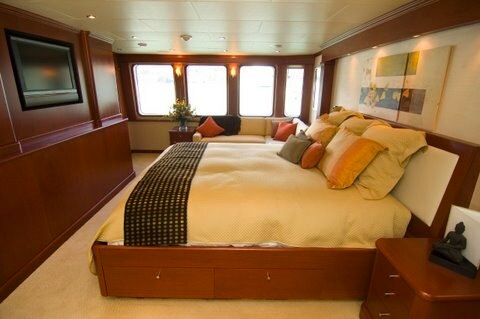 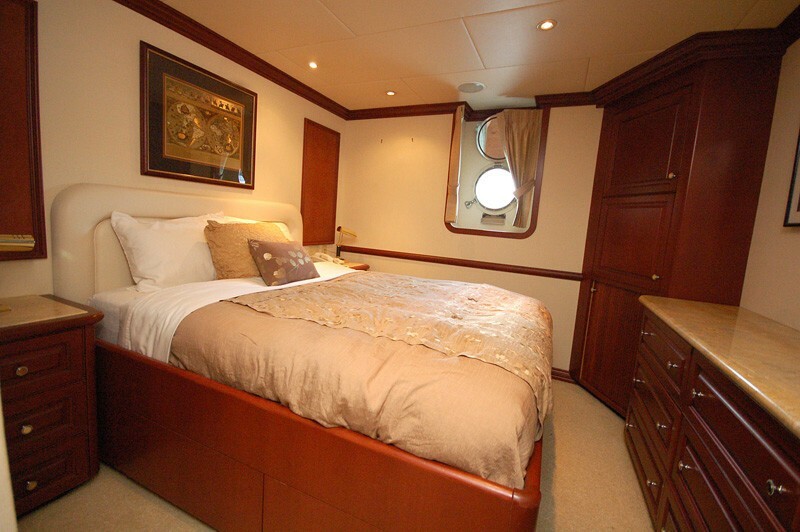 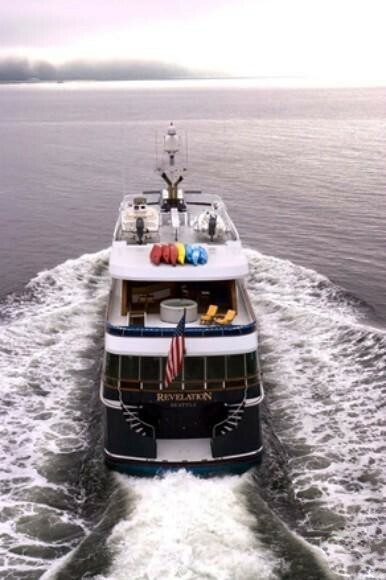 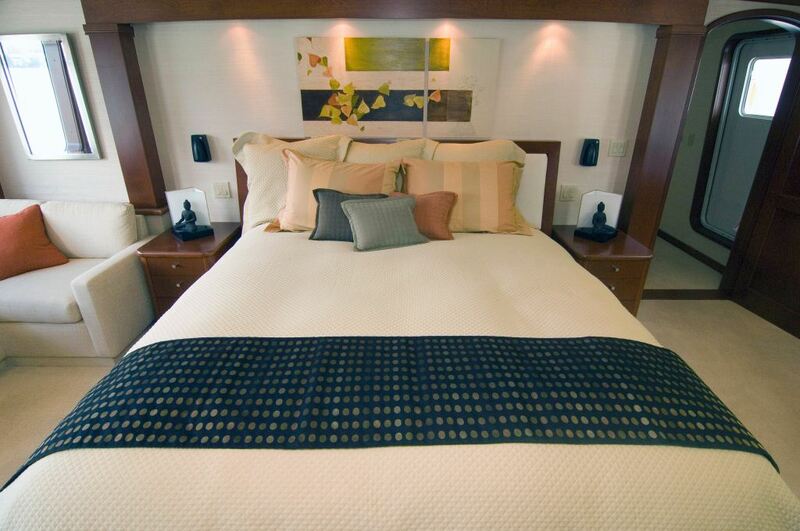 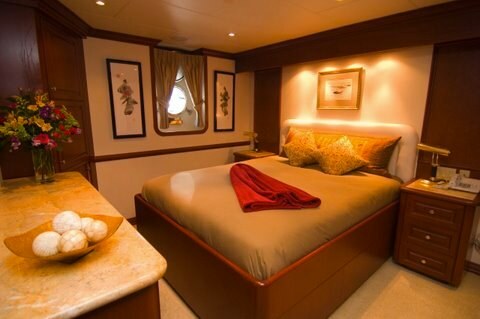 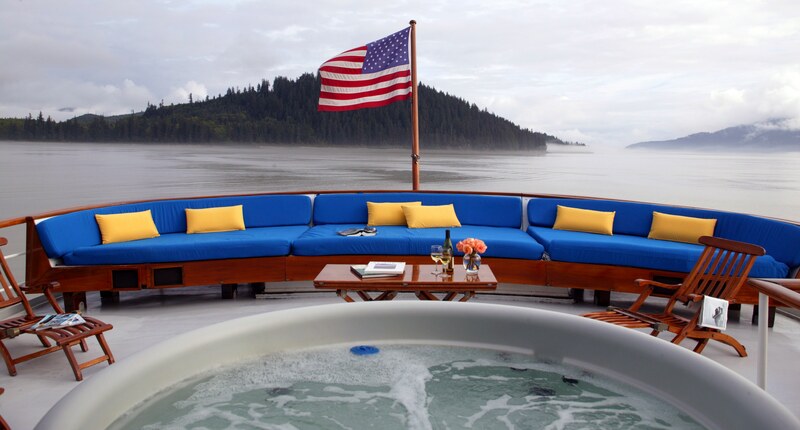 The Luxury Golf yacht Stargazer is able to accommodate up to 12 guests overnight in 7 cabins. 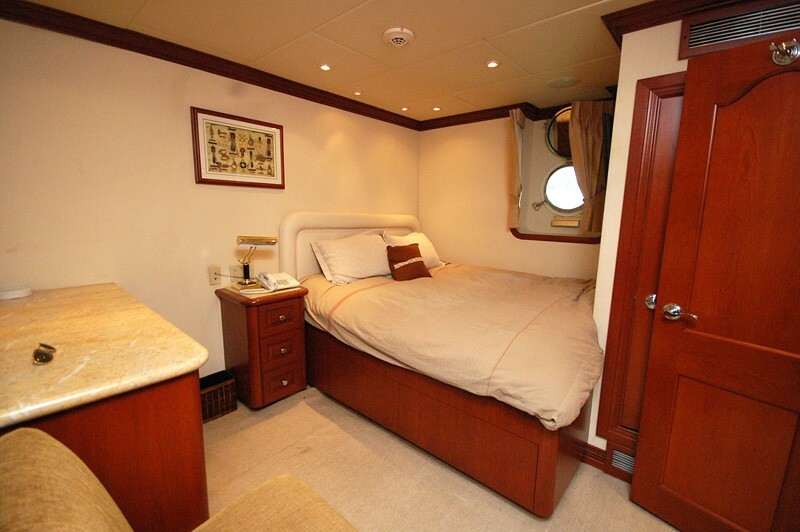 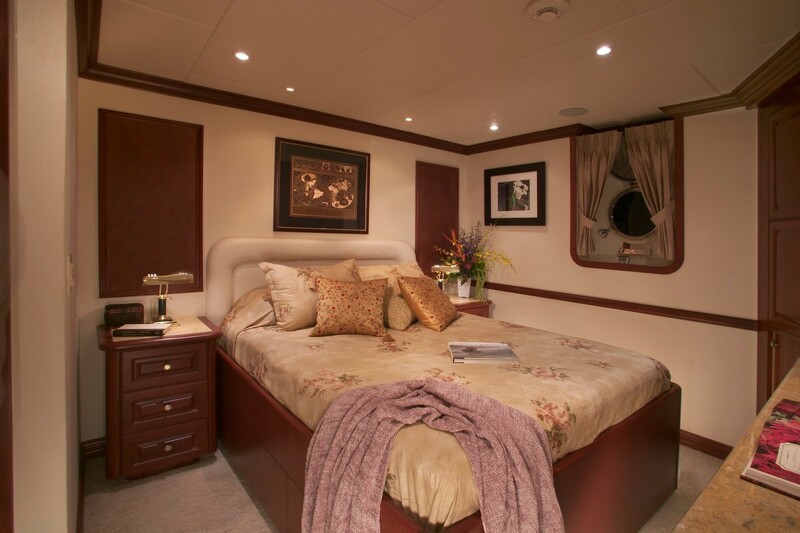 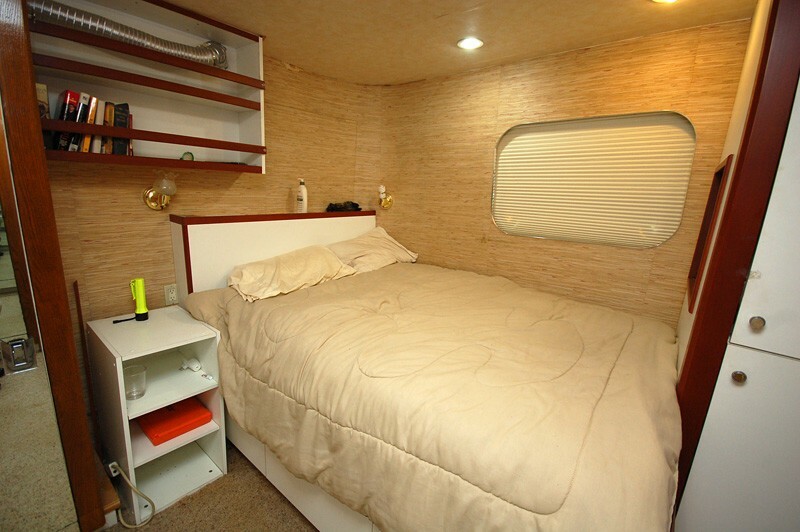 The cabin configuration consists of a Master cabin with a king size bed, bath tub, shower and toilet. 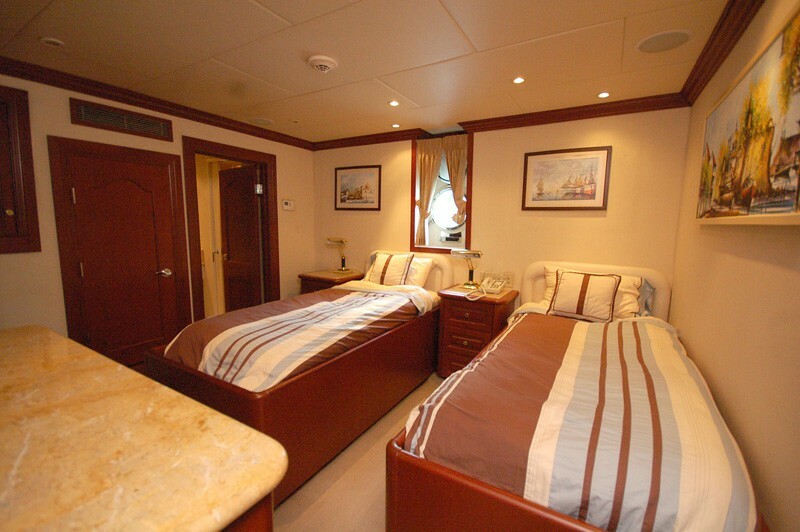 There are 4 Guest cabins with a queen size bed, shower and toilet. 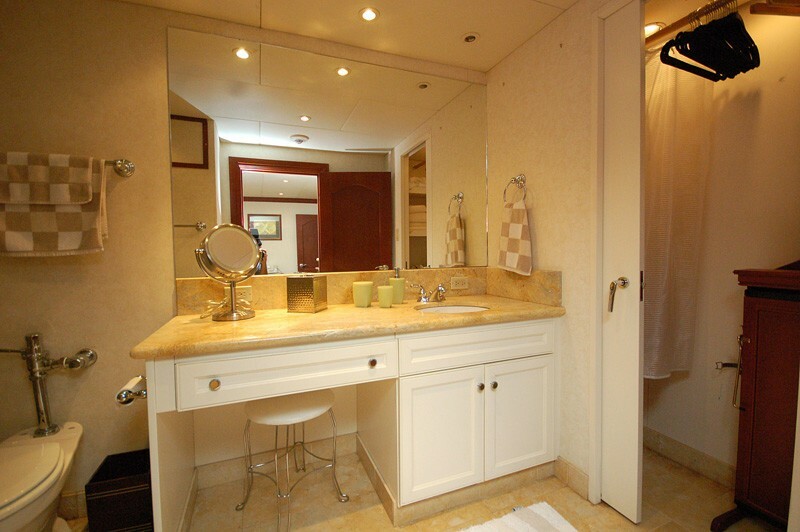 There is one Guest suite with a queen size bed, 2 single beds, a bath tub, shower and 2 toilets and a Guest cabin with a twin bed, shower and toilet. 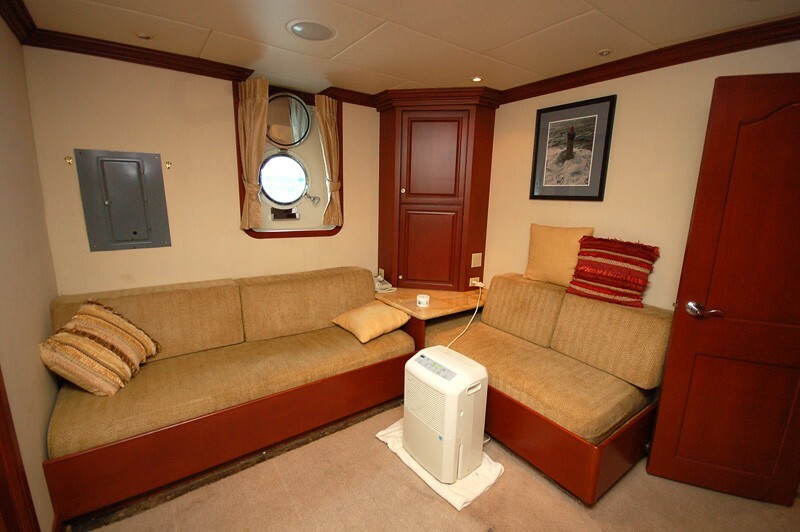 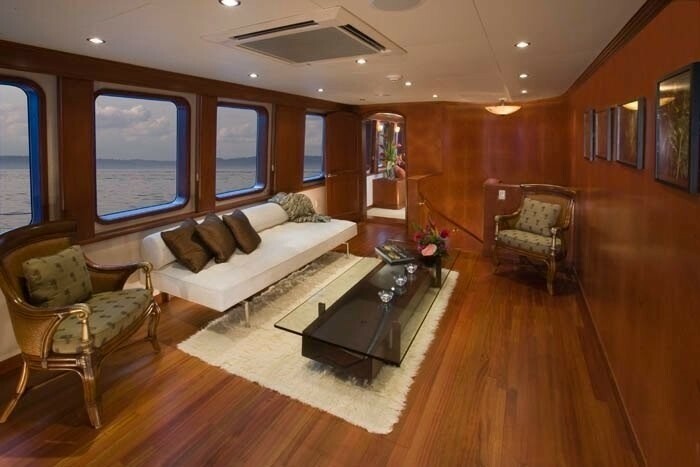 The motor yacht STARGAZER is fully air conditioned throughout. 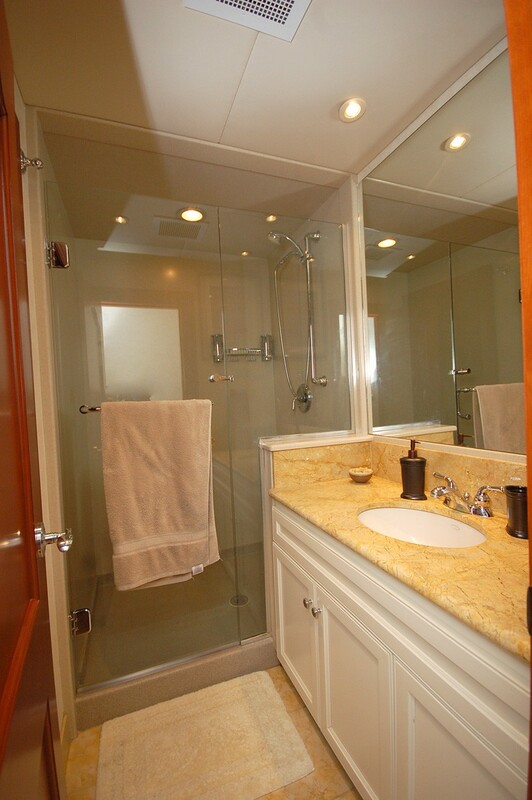 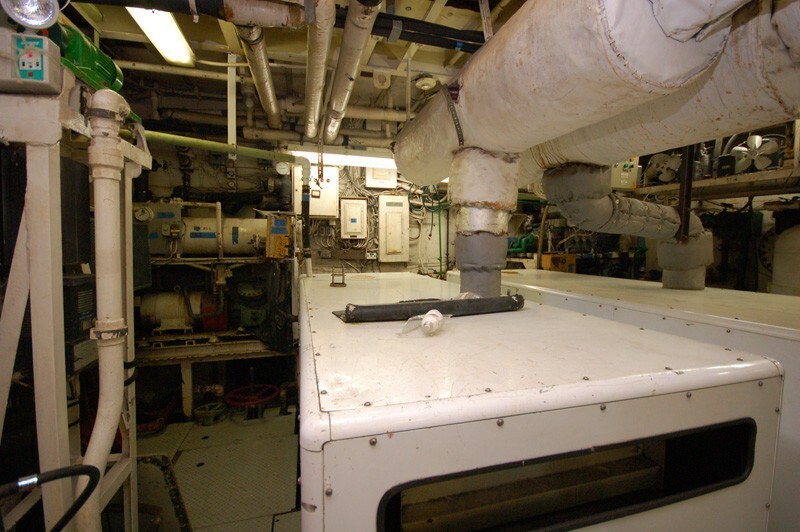 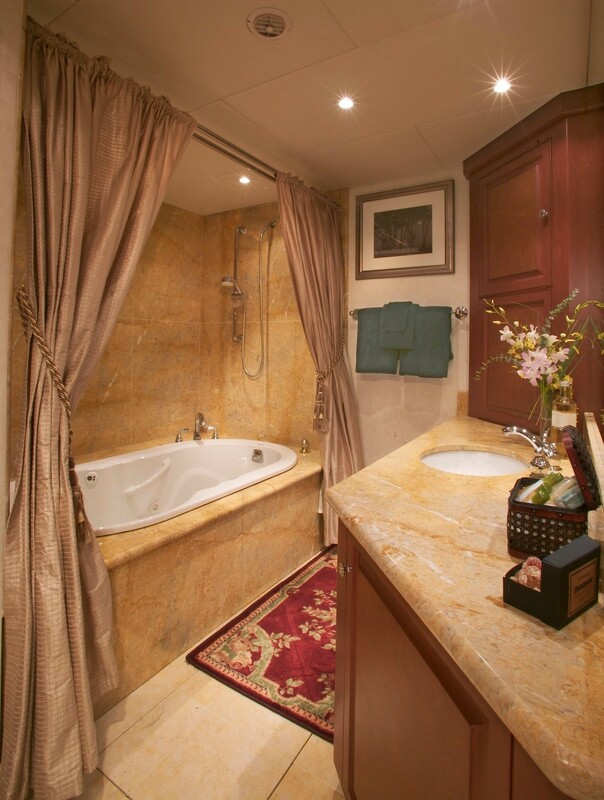 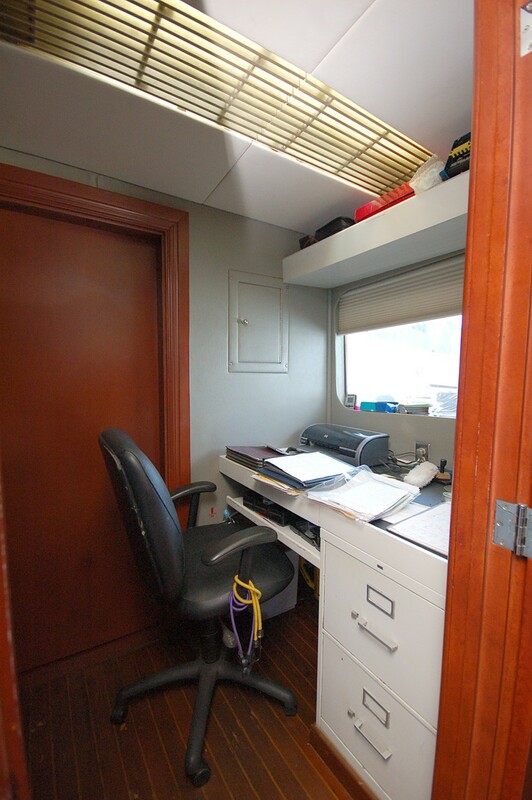 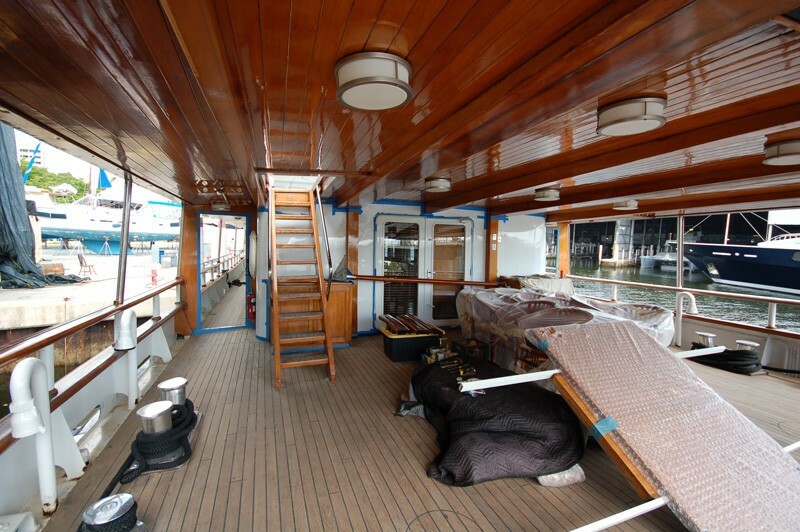 The crew are accommodated separately and have their own companionway, heads and shower.